Let’s say you’re a beer drinker. And, by beer drinker, I don’t mean no-other-adult-beverage-is-in-the-fridge-so-I-guess-it’s-a-good-night-for-beer drinker. Instead, you’re someone who first evaluates a restaurant by what’s on their beer list. What’s on tap first only to be followed by the bottled options. It may be very en vogue to be a beer drinker now, what with the explosion of amazing craft brews available from independent outfits, but I know someone whose delight for hops and yeast knows only the limits of what’s available in IPA. I can appreciate that kind of fixation with my gaze on tea (and have been noted to say more than two handfuls of time that “kombucha is my beer.” But let’s be honest, I can’t imagine tacos without Negra Modelo and have a penchant for Ranger with its elderflower notes. I’m a fan of dark oatmeal stouts too, but it must be said, anything I appreciate or know about beer originates with my main squeeze). Oh, husband. Lover of India Pale Ales. My dear heart. The man to whom I once gave an anniversary gift of a new-to-him-brand six-pack of IPA and a smattering of cheeses. 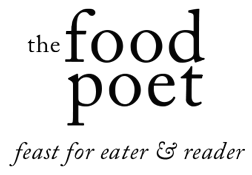 Man whose dad once owned a t-shirt emblazoned with the sentiment, “Wisconsin: Beer, Cheese, and a Few Weirdos.” He’s my weirdo and as such, I’ve never seen the kind of enthusiasm he laid down when he picked up Lori Rice’s first cookbook, Food on Tap. It should be known I’m a fan of adding beer to food (hello, frijoles borrachos!) and every autumn I make my Beer Braised Lamb and Leeks and, now to add to the list will be Warm IPA Braised Cabbage Salad. To continue, I like that each recipe name in Food on Tap tells you in the title which kind of beer you will use. She also includes tips in tiny print of specific beers to consider for the recipes, which will give you the best chance to taste what’s in her mind as she’s crafted these recipes. Or, that the recipes have both a homey essence to them but also with a deeper insider understanding that Lori’s background is in nutrition (and she’s penned a blog entitled Fake Food Free so you know that there is temperance in there somewhere. 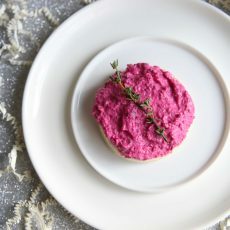 Her take on Pub Cheese for example riffs on holiday flavors for a Pumpkin Ale Cheddar and White Bean Dip (p. 63) where she sneaks in creamy legumes for texture but I’d bet also because they lighten a recipe that could’ve gone solely indulgent. I’ve cooked with beer before, but have received a request for the Nachos with IPA Beer Cheese Sauce (p. 97) or the Three Cheese IPA Soup Shooters (p. 59). Do you see a pattern emerging? I, for one, am keen to bake with stout over the holidays, most notably Gingerbread Stout Bars with Brown Butter Frosting (p.147) or the Peanut Butter Stout Chocolate Chip Scones (p. 53)– can you imagine those paired at teatime with a bold Assam or Yunnan tea? (Recipe reprinted with permission from Food on Tap by Lori Rice, published by The Countryman Press, October 2017). 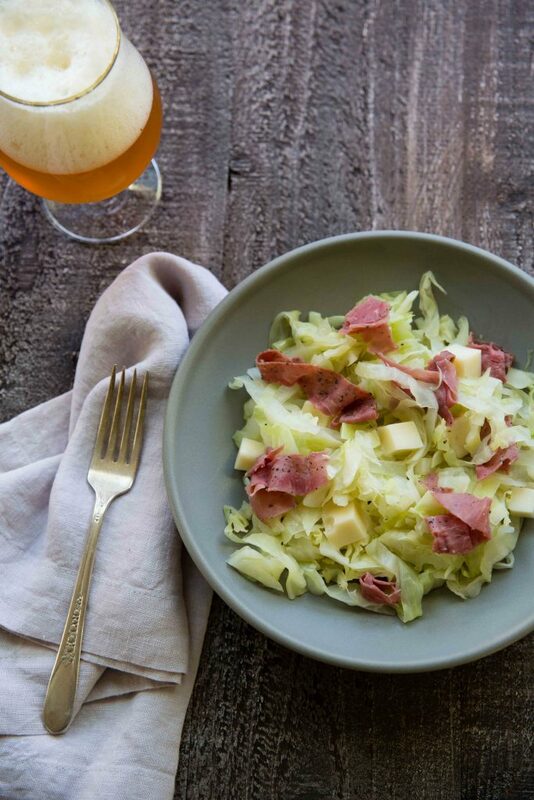 The beer suggestions for using in this salad inspired by a Ruben Sandwich include Stone Brewing Stone IPA, Bell’s Brewery Two Hearted Ale, and Bear Republic Brewing Company Racer 5 India Pale Ale. Racer 5 is a favorite in our house because of its flavors, but also because there might be a bicycle hanging from the ceiling of the Bear Republic restaurant in Healdsburg that belongs to one of my family members. Heat the olive oil in a large pot, such as a Dutch oven, over medium high heat. Add the cabbage. Turn to coat it in the oil. Reduce the heat to medium. Carefully pour in 3 ounces of the beer. Cook, stirring often, until the cabbage begins to wilt and the liquid has evaporated, about 4 to 6 minutes. 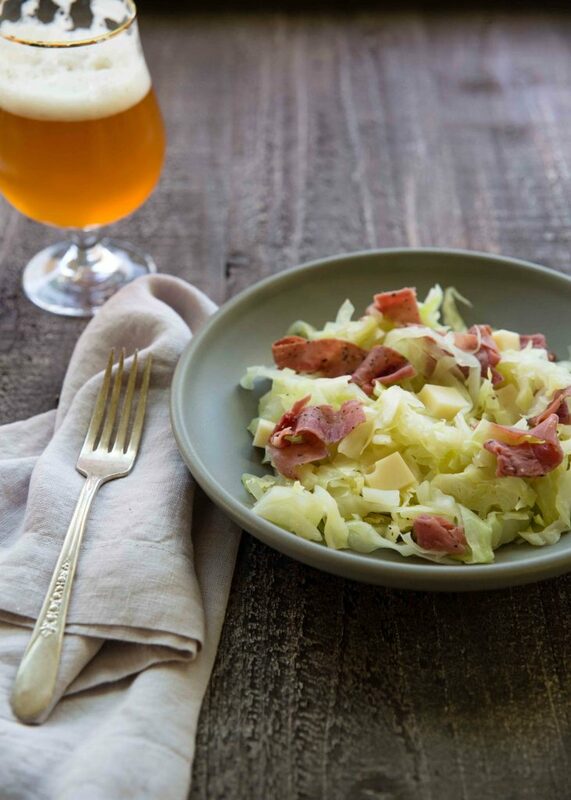 If you would like the cabbage softer, add more beer and continue to cook to reach your desired texture. Stir in the salt and pepper. Transfer the cabbage to a serving bowl. Toss in the pastrami and Swiss cheese. Serve warm. This is the loveliest of blog posts, Annelies! Thank you so much. I’m so glad to hear you like the salad. It is one of my favorites as well. And three times! Wow! I feel so fortunate that our paths have crossed. Thank you for your support! Lori- I keep telling people about this salad because it’s such a different way to cook with beer (that’s super easy and flavorful too). Great job! Hi Annelies – this is how I like my corned beef and cabbage, but I won’t be saving it for St. Patrick’s Day! I love how simple the recipe is and, of course, the addition of IPA imparting a bright, yeasty note. Lori poured her heart and soul into this book and I’m happy to have a copy as well! It is such a terrific warm salad for winter, Priscilla. 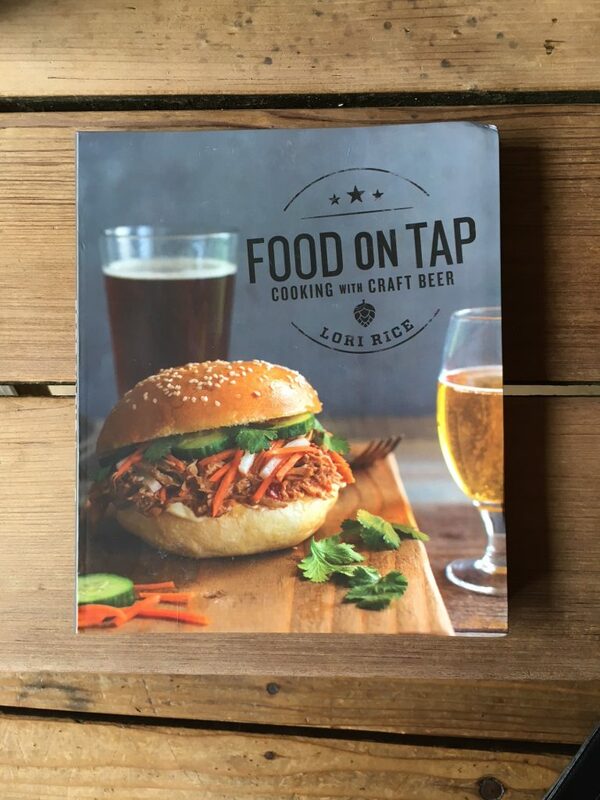 And you, are right, you can tell how much Lori’s passion and knowledge of craft beer are deeply present in “Food on Tap.” I look forward to seeing what you cook from it too.